Character and richness. Form and function. Creativity grounded in careful craftsmanship. Warmth and design captivate your senses. This is what truly custom is all about. Bringing insightful expertise and captivating designs to every project, we’re among the best home builders Edmonton has to offer. Let’s bring your story to life through timeless design. Original character shines through every Avanti home. We live and breathe home design. Inspired by Frank Lloyd Wright’s Prairie-style architecture, our Edmonton show home unites horizontal lines and natural elements to achieve harmony with its mature ravine backdrop. Autumnal colours, handmade materials and smart technology all weave together to create an organic, liveable atmosphere. From its one-of-a-kind kitchen and spacious media lounge, to an unexpected retreat space and cozy three-seasons room, the design flows seamlessly between open and private spaces. 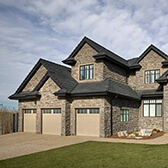 We build truly custom homes in Edmonton. Our designs and craftsmanship capture your character and captivate your senses.